Last year the Supreme Court of Sweden declared that poker was both a game of skill and chance. That's ridiculous - EVERY game falls somewhere on the spectrum of skill and chance (maybe apart from games with no skill like War). Even the best of board games depend on some dice rolling or card shuffling, and at some point superior skill can still be beaten by blind luck. Game shows are similar. On the one hand are shows like Jeopardy where the relative skill of the contestants almost always gets reflected directly in the score, and in the middle we have games like Wheel of Fortune (where the wheel can kill you) and even Who Wants to be a Millionaire (where randomly assigned dollar values and different questions between contestants don't allow for direct skill comparisons). 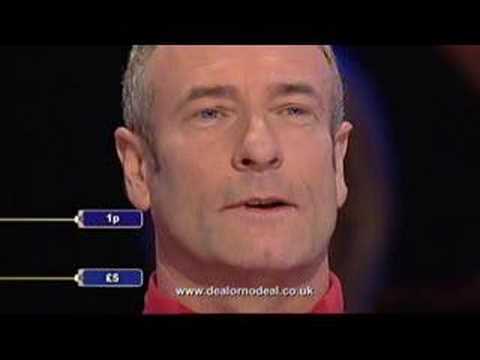 At the other end of the spectrum (just before Million Dollar Heads or Tails) is Deal or no Deal. Contestants get to point to cases and randomly eliminate dollar values until they either get bribed off by a computer algorithm or stick with the last dollar value that's left. (I mean it's a valuable contribution to society... did that sound sarcastic or something?) Because the choices contestants make in eliminating suitcases are absolutely random, the only impact that contestants really have is when they're presented with the infamous question Deal or no Deal? The fundamental focus of the game, these attractive prospects drive the action and fascination of the audience for an hour at a time. The suitcases are important too. The game starts off with 26 suitcases which range in value from $0.01 to $1,000,000. Assuming any given contestant picked a suitcase at random and stuck with it until the end, then the average value to be won would be $131,477.50. That sounds pretty good, except that the distribution of prize values is so unevenly distributed that half of contestants would get less than $875. Round one of the game involves picking and sitting on a suitcase, then arbitrarily eliminated six case values before any real decisions are made. Honestly - these choices can only be random and no strategy has any impact. Because of the number of cases being eliminated, by the time the contestant has to make a real choice the average prize money can vary from a worst-case scenario of $13,420.80 (median $350) to $170,916.30 (median $17,500). That's a massive difference, and it's the range of opportunities that contestants could be faced with before any sort of strategy could take effect. After the contestants set themselves up arbitrarily for success or failure, a mysterious algorithm completely real human being offers to bribe the contestant out of the game. This algorithm shrewd businessman only really takes a small number of things into account: making the game entertaining for the audience, and losing as little money as possible. Now obviously the game show guarantees that every contestant is going to walk away with some amount of money, and as we saw before if every contestant just held onto their suitcase then they'd each get about $130,000. If the show wanted to produce a given number of hours of material per season, then, they would lose the least amount of money if the contestants each played the game for long time. And what's the easiest way to keep people in? Offer them lousy deals. In fact, an analysis of bank deal offers has shown exceptional cruelty in offering deals. After the first round, the deal that is offered is usually only about 10% of the average of the remaining suitcases. Nobody in their right mind would take that (then again, most people can't take the average of 20 dollar values in their heads and may not know how much they're being ripped off), and indeed nobody on the US version of the show took that deal. In fact, nobody took a deal at all until the offer was at least 50% of the value of the average remaining prizes, which never occurs until at least 20 of the cases have been opened (round 5 of the game). Shrewd indeed. They did, however, end up at around 95% of the value of remaining suitcases right at the end of the game if the contestants stuck around that long. The only exception is that sometimes if someone does really really poorly on the initial rounds, the offer tends to be a little bit higher just to make the game less depressing. The actual variable in the game, the contestants have the opportunity to just mess things at any point in the time. Before talking about what was observed, here's a riddle. What would you rather choose: a deal for $3,000 or a 50/50 chance between $1,000 and $5,000? What if instead it was a deal for $7.50 versus a 50/50 chance between $5 and $10, or a deal for $875,000 versus a 50/50 chance between $750,000 and $1,000,000? In each case the deal was exactly the midpoint value between the 50/50 options, so the expected value for either choice is the same. The only difference between the two choices (from a rationality point of view) is the amount of risk a contestant is willing to tolerate - are they willing to accept a low amount of money for the chance to get a higher amount? Personally I have a pretty low risk threshold - in fact, I'd quite likely be a terribly boring contestant on the show. What was interesting was that the choices of the contestants on the show depended much less on a rational analysis of the situation, and more on how well they'd done previously in the game. For instance, candidates who had terrible luck in the game (and could theoretically be left with a $5 or $10 scenario) were the most risky - very few of them took the deal. This is partially due to the fact that quite frankly a $5 difference isn't really much of anything, but more generally also falls under the category of decision-making known as the break-even effect, where gamblers are more likely to choose options that have the possibility (however remote) to bring them above an arbitrary prize value, even if the expected return is low on the choice as a whole. Contestants with about average luck (similar to a $1,000 or $5,000 scenario) were much less risky. They tended to sit at comfortable levels of money either way, and settling for a guaranteed money value was much more appealing than risking a couple thousand either way. What was really interesting was that contestants with the best luck were almost as risky as the players with the worst. Even though the potential swing between choices was hundreds of thousands of dollars, most contestants again rejected the deals offered. This is explained economically by a decision-making process known as the house-money effect, where gamblers are more likely to exhibit risky behavior when they feel like they are playing with money that isn't theirs. Rationally, a contestant in this situation has a guaranteed $750,000, and is facing a choice between a deal of $125,000 or a 50/50 chance between $250,000 and $0, but they tend not to look at it that way. So there you go! Deal or no Deal really is a fascinating show from a game theory and decision-making theory point of view. PS A lot of people weren't so happy with the Monte Hall Problem I mentioned in a previous post. Superficially, the last rounds of Deal or no Deal may look a lot like the Monte Hall Problem - a contestant has a case (door) chosen, a third case (door) is eliminated, and then the contestant has the choice of switching their selected case (door) for the one that remains. Unlike the Monte Hall Problem, though, there is no advantage from switching in Deal or no Deal, because the one case that gets eliminated in the intermediate step runs the risk of being the highest-value case. Sorry to disappoint.